With the help of a collector, Sonny Rollins has taken the curating of his career in a new direction. Carl Smith isn’t technically a bootlegger, but until a few years ago he had a hard time convincing Lucille Rollins and her husband, Sonny, the famed titan of tenor saxophone, of that fact. Smith’s activities throughout much of his adult life–he’s 70–contributed greatly to the Rollinses’ perception of him; Smith’s home in Portland, Maine, contains an extensive library of Sonny’s live performances dating back to the late 1940s, before the budding musician had left his teens or the family home in Harlem. The recordings were made in venues all over the world–some surreptitiously, others by Smith. Perhaps instead of mogul, though, the term “curator”–a shrewd tender of his own art, legacy and image–would better suit Rollins these days. After all, he also tapped into his magnificent collection of private recordings as well as the Carl Smith archive to assemble Road Shows, and now oversees his career in a manner unprecedented for a musician of his generation and stature. Early on, Rollins’s triumphs tended to go hand-in-hand with his sabbaticals from the jazz scene. He often marked each return or phase–the most legendary one followed the two-year hiatus at the turn of the ’60s, in which he could only be heard in public practicing on New York City’s Williamsburg Bridge–with a sartorial shift as strikingly contemporary as his leaps in sonic acuity. The mohawk haircut Rollins sports on the back cover of Sonny Meets Hawk! (1963) is as wondrously eccentric as the sculpted white beard and goggle-like shades he prefers today (the specs were Sonny’s look before they were Bono’s). 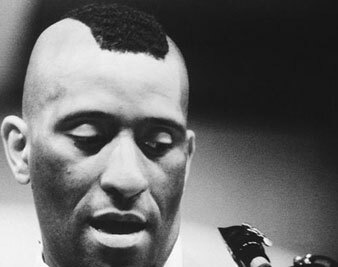 During a talking-head interview in Robert Mugge’s 1986 documentary, Saxophone Colossus (issued in January on DVD), Gary Giddins, jazz’s foremost critic, gleefully muses on how, in concert, Rollins’s visual sense has the effect of maximizing your pleasure when his playing is at its absolute best–not the kind of talk one generally expects from a jazz aficionado. It’s not hard to see the film’s marvelous opening quintet sequence as a spirited rebuke to the detractors, with Rollins making the most of a panoramic, open-air venue in upstate New York by voraciously digging into “G-Man,” an original composition, for fifteen suspense-ridden minutes. The band is already hurtling along at top speed when Sonny holds a note at the six-minute mark that signals he’s upshifting again; Mugge’s editing catches each band member’s knowing yet awestruck smile as Rollins leads them up Olympus. On a later piece, Rollins’s sense of theater is on display as he leaps from the stage mid-solo and continues playing, even though, as is disclosed later, he sustained a broken heel. Although the film slows down a bit later while on the road with Rollins in Tokyo–he premieres a piece as the featured soloist with a symphony orchestra–it’s still valuable as an example of a world-class artist intent on facing down new challenges. He may have little to prove anymore, but that doesn’t seem to have stopped the Colossus from growing. K. Leander WilliamsK. Leander Williams is a freelance writer living in Brooklyn, New York. He's been around the block a few times and has yet to tire of the scenery.